Have you ever had your hands full of cute? Well, after seeing these pictures, you will at least wish you had. Blue Clover Rabbitry from the Pacific Northwest is a heaven on earth for those, who love fluffy cute things that fit in your palms. Blue Clover Rabbitry have been breeding rabbits from 2011 and helped hundreds of tiny furry babies to find their loving families. They specialize in raising Holland lops. The owner and operator of the Rabbitry is Adriana who is proud of their close and hands-on approach towards breading of the rabbits. 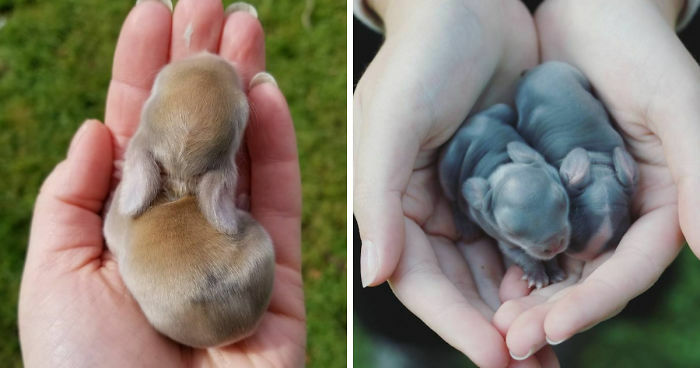 "We handle our bunnies from day one when they are born," she wrote on their website. "It is not dangerous for our bunnies to be handled when they are newborns because our rabbits are domesticated and we have a very strong bond to all of our does. They will not reject their babies like wild rabbit mothers would do." "Their first sense is touch. Once you've created that warm and safe bond holding them in your hands, when their eyes open they can quickly associate that you are a safe zone for them. Bonding with them when they are newborns is a crucial part of raising rabbits at Blue Clover!" Below you can see some of the adorable Holland lops babies. Which one is your fave? Let us know! this ones gonna be named snowball! aww, looks like a little furry potato! This little one has lovely coloring. I'M DYING NO MELTING NO I DON'T KNOW WHAT I'M DOING BUT I KNOW THAT THIS IS SO CUTE! This could be a squirrel. They're hard to tell apart when they're very young. The little back foot is so cute! This should be at the very top! Well, all of them! Read the article at the beginning. It addresses this issue. Stunning colours and I want to stroke those fully ears so bad! OH! This one has got attitude!!! They all look like shaved guinea pigs. So cute! Look at those fuzzy ears! Hard to say which one is the most beautiful of them all! Oh god...the tiny stubby arms, the soft belly. You can't get much sweeter than this flufster! Do the pure whites have the same sun/skin problems pure white cats do ? With that coloring It looks like a little piggy. It look like silver champagne!!! Sweet little paws and a white nose. So precious. I love when they are this leetle!